The eye functions on the same principle as a camera. 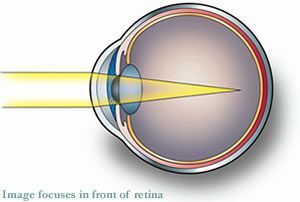 The cornea (the clear window of the eye) and the lens, located behind the pupil, serve to focus the light rays from the object viewed onto the retina in the back of the eye. 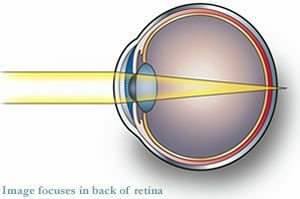 Astigmatism occurs when the cornea/lens combination fails to focus the light rays to a point source on the retina. A normal circular or spherical cornea focuses images to a sharp point. A cornea with astigmatism is essentially oval (or football shaped) and therefore, fails to focus images clearly, resulting in blurry vision. Nearsightedness is a condition where light rays entering the eye are focused in front of the retina instead of directly on it. This condition causes blurred vision when looking at objects that are far away, while close objects are seen clearly. Myopia is an inherited condition caused by an excessive length of the eye or the cornea being too steeply curved. Presbyopia is a condition associated with aging where the ability to see fine detail up-close becomes increasingly difficult after the age of 40. The lens gradually loses its ability to focus or accommodate, and near vision becomes blurred. Presbyopia is a part of the natural aging process of the eye and affects every individual. Farsightedness is a condition where the light rays entering the eye are focused behind the retina instead of directly on it. This condition causes blurred vision when looking at objects up close and at a distance. Double vision can occur due to abnormalities of the muscles that move the eyes or the nerves that control those muscles. The double vision can be side-by-side or up-and-down. Double vision should be evaluated with a full eye exam.